Simpson Heating & Air is proud to serve the Bolivar community! About Bolivar, OH - Happy to be your hometown Heating & Air Conditioning Contractor! 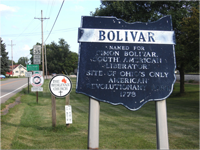 Located in Tuscarawas County, Ohio, Bolivar is a small community with a population of approximately 1,000 people. Consisting of about 0.70 square miles of total area, Bolivar is located along the banks of the Tuscarawas River. This community is known for being the home of Fort Laurens, Ohio’s only fort from the era of the American Revolutionary War. The weather of Bolivar is affected by the Great Lakes, so while summers are hot with high humidity, winters are usually snowy and cold. Bolivar is home to several notable attractions and areas of interest. Historical sites include the Fort Laurens Museum and Fort Laurens Memorial. The Organic Gardens are another notable destination, and the Wilkshire Banquet Center is a popular destination for business meetings and wedding receptions. Other destinations are located in nearby Canton, including the National First Ladies’ Library and the Pro Football Hall of Fame.